Random musing from a psychic's perspective. Our little Miss Grace left her earthly furry body on Feb. 21st, 2019 in the middle of the Snowstorm of the Century here in Sedona, AZ. Grace was an important part of the ACS team and was a wonderful healer dog! Mommy loves you every so much and misses you every day big girl. Looking forward to seeing you again in a new dog body, so we can have more Earth plane adventures! Who are you Starseed? Frequency Holder? Bearer of Light? When we recognize WHO WE REALLY ARE, we then can recognize who others really are as well! To do so, we must be centered and residing in our Core Heart Space. This is mandatory to see this truth about ourselves and others. So many folks have gotten disconnected from their authentic Core Heart through the course of their lives. They have forgotten, got distanced or distracted, gotten lost, or sidetracked from their authentic self! No shame or blame, as this was what we came here to learn about, fear and separation from Source. That Soul Contract is done now, time to shift, especially for those, who are reading this post. To continue to be separated and live in fear, however is to continue in the old 3D paradigm, which is what we came here to SHIFT! We are here to shift the paradigm into Unity Consciousness and the frequency of Service to the All. Service to all does not mean we sacrifice ourselves for others, or that we put ourselves last, or that we are a servant to someone. No indeed not. That is old 3D paradigm! Service to ALL means that we are smack dab in the core of our authentic Heart and we CLEARLY recognize who we really are, thus we see this in others! We also shine OUR BRILLIANT, beautiful light out to the World for others to see with no fear! No shrinking to fit the space, no more hiding and no catering to someone else's ego. If you are a frequency holder, star seed, ascension worker, grid workers etc..you know who you are, who has came here to HELP assist and SHIFT this planet out of the 3D paradigm, it is TIME! Each one of us doing OUR specific job is crucial in the accomplishment of this mission! No one job is less then or better then. Yes, some of us are Master activators and transformers and some of us are still in apprentice states, with others in between. This does not matter, as ALL are EQUAL in the paradigm of service to all and UNITY! Our job is to SEE the bigger picture and not be languishing in the old service to self paradigm. That means stepping out of living in the polarity of the self serving ego and activating our Inner Trinity. We are in Service to ALL now, which means no more playing little, hiding behind fear and insecurity, avoiding our own shadow, unresolved issues or playing the competition game!!!!!! We must own our stuff, be responsible and do our inner work and set the example! Our goal, our number one goal right now is to get reconnected to our Inner Core, to recognize our true Authentic Light, if you have not done so thus far and shine that LIGHT out to the seven seas! How you do that is entirely up to you. Team Light, this is Our official CALL to arms so to speak! It is time to step up to the plate and step into our MOST authentic Core of light/self/heart and led the way for the New Earth Consciousness. We will not failure..the end has been already decided. All we have to do is BE OUR AUTHENTIC SELF! Ooh my cells started ringing! lol BE THE LIGHT YOU CAME HERE TO BE! First written on March 15th, 2018 and republished today. Over the years, I have refined from saying to much about religion., as it is such a personal thing and I feel we all must discover our own path to Source. But now feels like a moment I need to speak up. While we now have access to higher vibrating consciousness, we still live physically anyways, in the 3rd dimension of polarity that is still under a strong form of frequency control. Religion, along with money, politics, and now food, the weather, the media and cell phones ( technology in general) are all used as a means of controlling the Masses ( Collective Consciousness) and spreading plenty of misinformation. As the light increases, so does the dark. The light brings it forward to examine, so we can shift our viewpoint and bring it into resolution. It is through our intuition, that we can discern between that which is dodgy dark and divine dark, and that which is dodgy light and divine light. As long as a fragment of our Soul resides in a DNA skin suit, we will experience life through the lens of the 3Rd dimensional, polarity experience! Our challenge is to find the zero point or neutral in any given moment. Our intuition is always our guide and speaks to us very quietly! It is NOT fear based and is usually always our very first thought. Once the intellect gets in there, we can get muddled up pretty fast. If you hear yourself saying things like “my heart says, tells me or feels like OR my gut tells me, says or feels like” you can be sure, that you are “hearing and feeling” your inner voice of intuition. Let me say that any belief that says we need some other person or being to help us find “ God” is way off track. We are God, a beautiful representation of Source Creation incarnate. All answers are found within ourselves! ( Even though we may need to Goggle or read a book to find something out! lol) Many folks have just forgotten this. Our World is our mirror and that which is within ourselves. Many are still functioning on half truths and misinformation, as this has been what’s available. “ God” is within us and any belief that creates separation from our inner self and intuition and or is encouraging us to give away our power to an outside source is based on the inverted, Antichrist, 3D polarity programs. Religion instantly comes to mind! I personally would lump all religious dogma into that inverted program, except perhaps Buddhism. The Bible has some great FYI and I feel is not to be taken literally in many cases. I love books, but I trust what I KNOW over anything I read or am told. The key here is to follow our OWN GUIDANCE, not some religious or spiritual leader! Listening and gathering information is one thing, and turning our power over to someone else is another!! Finding our own path to center and reclaiming our empowerment, along with speaking our authentic truth is of vital Importance at this time. Everything that is written is a form of consciousness and contains the writers energy...I will repeat this..everything that is written is a form of consciousness and contains the writers energy.. The written word is powerful no matter whether it’s written, spoken (reading written words out loud) or read silently. How we perceive, translate and experience this energy is entirely up to us of course....however, messages, posts and texts, they all come with the senders/writers ENERGY, which can be felt and perceived by someone who is reading it, as all things are consciousness and carry a frequency of some kind. This also includes photographs. This was confirmed for me again, the other day, when a friend shared my flower post on Facebook and said she felt happy when she saw it. I also felt very happy when I took the photograph, so this confirmed to me, how our energy, becomes a part of the photograph, text, message, or even email. We can feel whether someone is coming from a place of kindness and love, angry and meanness or even sarcasm etc...by what they write, say or do. We just need to be aware and tuned in, paying attention. if after we read something and we suddenly feel sad, mad or unhappy, you can bet, you may have picked up some o the senders frequency broadcast. What we pick up, is always based on whats a frequency match. There is no need to be unkind when we express ourselves, just as their no need to convince someone of our viewpoint. © Heyde Class/A Celestial Solution Written and haphazardly edited by Heyde Class. This was just perfect for this New years day..We are the Love.. 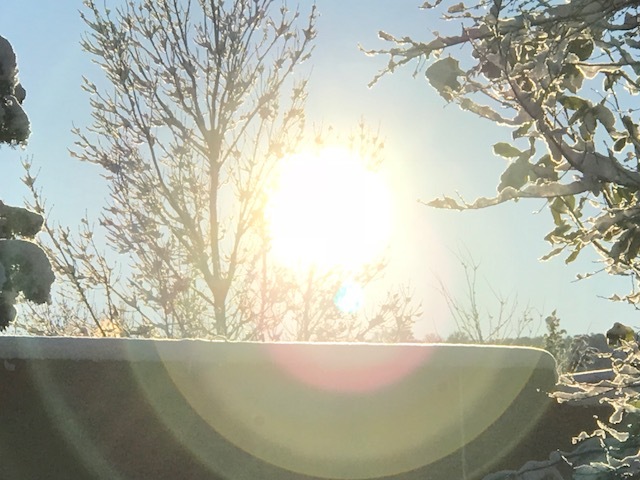 These were taken this morning, 1/1/19 around 8:20AM In Sedona, AZ. You can see the portal of the New Number energy flowing in! Transitions bring both endings and new beginnings. Some transitions can be painful, others joyful, while others may be a combination of both. We may experience relief, sadness, gratitude, anger, unhappiness, fear, joy etc. and or many other feelings and emotions during these transitions. How we experience these shifts/transitions depends on our view point, attitude, our beliefs, perceptions, thoughts, our feelings and e-motions and our responses..in other words..HOW WE CHOOSE to "experience," the experience! Our point of "empowerment" is in our OBSERVATION and ACCEPTANCE of the experience unfolding in front of us, understanding and recognizing that life is happening FOR us, not to us, that how we respond to this experience is our CHOICE and that we solely have control over ourselves, our responses and actions and that is pretty much it! Everything else is out of our hands and the experience will unfold as it will. Our loving and accepting thoughts about it, however, can and will influence some of the outcome. As we move from 2018 to 2019, we ALL will be experiencing some kind of transition, desired or not, even it's just simply shifting to the "number frequency," which will bring many new opportunities and lessons into our lives. In numerology terms, 2019 is a 12/3 year. (To get your personal year, just add 3 to your birth day and month and reduce to a single digit. ) A year to reconnect to our Inner Trinity, bringing these three aspects of self into better balance and alignment. There will be many new opportunities for us to take our lessons from 2018 and integrate them into our new vision and path. Since 2017, we have been laying down the foundation for a whole new us, and this year is no exception, as we continue that work. Now, we have the opportunity to activate, reconnect to and align our Inner Trinity. We will discover and remember, HOW to be a true Master of self! We will learn HOW to master our Personality Self and bring any separated parts into alignment with our Core Heart. For some, they will begin to activate their heart space and reconnect to their Inner Child once again. Others will find themselves bubbling with joy and excitement, as they live more fully in their beautiful Core Heart, our Zero point. Some folks will finally be meeting or reconnecting to their Divine Self, handing the keys of the castle over to this trustworthy part of self, that will guide their paths for year to come! While others will be renewing and solidifing our connection to our Divine Self, now hearing with better clarity and understanding, all which our Divine Self imparts. We all have the opportunity to bring our Inner Trinity into a better state of balance, wholeness and unification this year. Authentic living means living whole and in the HEART, while connected to ALL aspects of our self. When we embrace the totality of ourselves, this is what really helps us be WHO WE ARE!!!! When we stop rejecting parts of self as undesirable and embracing them for the key role that they play in our lives! Love every single bit of you, because all those wobbly bits, the happy bits, the silly bits, and stubborn bits, and the separated bits ( ego) are ALL YOU and working FOR YOU, not against YOU, doing the best they can with the knowledge they have. Even when appearances suggest otherwise, with some of our wayward aspects of self, sabotaging our efforts and "working against us, “ embrace and love them all! These aspects of ourselves are doing their best to get our attention and are there to helps us learn a valuable lesson of some kind. These parts of ourselves are the ones that need the most tender, loving care! It takes time, effort, love and acceptance to integrate these aspects of self into wholeness! Having an open heart and mind and be willing to go there is SO key in achieving this balance and mastery! Blocking Life OUT is NOT THE ANSWER, nor while we find solutions in hiding behind these blocks and rejections of self. This year, 2019, we will see and experience many new beginnings and ends, that allow us to move through the Trinity cycles of birth, life and death. We will have MANY opportunities to get all the wobbly bits back into a place of stability. We will leave a few things behind and began afresh. We will smile, giggle, laugh, cry, scream or shout. As it takes our intention, willingness and conviction to walk our authentic path. This year will prove to be a fascinating adventure of love, light and hopefully FUN! Namaste and Happy Number New Year. As the creative juices began to flow, eventually this Psychic Intuitive will have something to muse about, other than saying, its under construction! So for now thanks for visiting and for being patience, as I try out this whole blog scene! :) Years ago, I would have had a million things to say, but now, well now, its really need some kind of order! Neptune in Pisces is transiting in my 3rd house of communication, so I am a bit in the clouds when it comes to writing! You can also check my Facebook page, as there are some true gems on there, worth reading I might add.